Settle your Florida home or business insurance claims with a professional insurance adjuster on your side! Living in South Florida & Have an Insurance Claim? Get all the money you deserve, even if you’ve already been paid from your claim. Obtain a FREE consultation & inspection with no obligation. Attention Florida Residents! All Lines Public adjusters represents you not the insurance company. Hurricanes, Storms & Wind Damage in South Florida! Do you Have a Hurricane Damage Insurance Claim or Wind Damage Claim and live in South Florida? 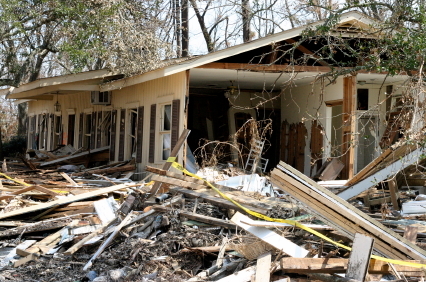 In the Last 5 Years, Did you have a Hurricane Damage Claim that Settled for much less than you deserved? A Study done by the Office of Program Policy & Government Accountability Showed that Hurricane Claims handled by Public Adjusters Settled for over 700% (747 percent) More Money than those handled by the Policy Holder directly! Our Licensed Public Adjusters are Experts at Hurricane Damage Insurance Claim Recovery for Florida Residential & Commercial Insurance Claims. If you lived in South Florida, between June 1 – November 30, the threat of experiencing a hurricane is very real. Hurricanes are usually associated with damage on a potentially huge scale especially in the South Florida Area. Hurricane damage to your home or business can result from intense wind, flooding, debris, and massive amounts of rain that hurricanes deliver. When faced with hurricane damage, the last thing most people want is the added stress associated with filing an insurance claim and having to negotiate an insurance settlement. Let our professional Florida Public Insurance Adjusters at ALL– LINES Public Adjusters provide you with peace of mind and money you deserve. Let us take care of your Florida insurance claim recovery. When you are faced with hurricane or storm damage, before you call your insurance company to try and settle a claim, call our expert team of licensed public adjusters. We are the specialist in hurricane damage assessment & recovery for Florida residents & businesses. We work for you, as your insurance claim advocate, to make sure your insurance company pays you for every bit of loss associated with your hurricane damage insurance claim. We are public adjuster experts in assessing all hurricane windstorm damages & providing insurance companies with the real proof & documentation they require to pay top dollar on your hurricane claim. Your insurance company has professional adjusters that look out for their best interest; so should you. We negotiate with your insurance company for you! We obtain maximum claim settlement for you! 2. If you had a hurricane damage claim less than 5 years ago in South Florida & you were either denied or under-paid, it is not too late to get your insurance company to pay you the money you deserve! 3. If you lost personal or business florida revenue as a result of hurricane damage (or any other kind of insurance property damage), you could be entitled to recover lost revenues, temporary moving expenses & more. With a thorough, FREE insurance claim analysis, we will take advantage of every provision in your policy to get you every penny you are entitled to. Call our South Florida office today for review of your Insurance Policy & assessment of Damages. Your Insurance Company has adjusters that look out for their best interest and so will you! 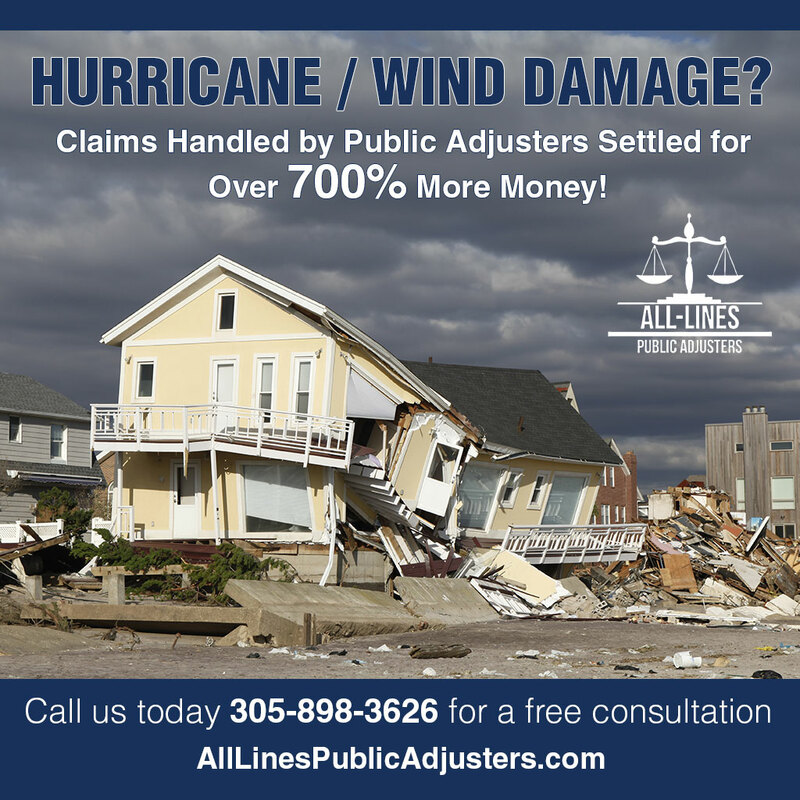 ALL– LINES Public Adjusters is a Public Adjusting Firm in South Florida specializing in insurance claims. Our company continues to be an advocate for the rights of the insured to justly and aggressively pursue the resolution of an insurance claim for Florida residents & South Florida businesses. While you may be familiar with insurance claims adjusters and what they do, you may not realize that policyholder specific assistance is available from a public insurance claim adjuster. Working with a professional public adjuster could make a huge difference in how much you collect from your insurance company (700% More!). We can also help make a difficult time less stressful for you. In order to understand the benefits of using an experienced public adjuster, keep in mind that your insurance company’s claims adjusters are trained professionals who evaluate insurance claims to determine how much money a covered insurance loss or property damage is worth – from the insurance company’s perspective.